What does the flame in the heart have to do with the path of discipleship? How do you unlock the potential of God within? What are the seven rays? What do the seven rays have to do with the Path? Who are the chohans of the rays? Mrs. Prophet, what does the flame in the heart have to do with the paths of discipleship in the Aquarian age? You know, there have been disciples of Christ and of Buddha for thousands of years. Even before the coming of Christ and Buddha there were followers of the essential flame of God. Discipleship, then, can best be studied in the lives of the great disciples of East and West. I was thinking this morning of Saint John of the Cross, who wrote The Living Flame of Love. The fulfillment of his life was the discovery of this intense love of God whereby God gives himself totally to his servant and the servant gives himself totally to God. And in this consummation of love, there is a fusion whereby God becomes man and man becomes God. This is only possible through the threefold flame in the heart. It is only possible because God has already endowed us with sonship by placing within us that portion of the Christ, the only begotten of the Father-Mother God. John the Beloved, who was the closest disciple of Jesus, the true mystic of the twelve, understood this joint heirship. He wrote, “Now are we the sons of God.” He understood that we have been endowed with the same essential flame of the light and of the Word as Jesus. 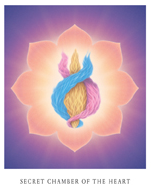 This is our moment, our hour of initiation, to draw forth that flame through Jesus, through Saint Germain, through Gautama Buddha, through Mother Mary, through all of the sons and daughters who have found the same key to unlock the potential of God—and that key is this flame within the heart. Discipleship is an important initiation because the disciple who places himself under the tutelage of an ascended master—let us say, Jesus—stands in line to receive not only the training and the teaching but the very God consciousness of that master. This hierarchical relationship has been known as that of the guru and the chela in the East and that of the master and the disciple in the West. Buddha had his closest disciples. Elijah had his disciple Elisha, who received his mantle when he was taken up in a chariot of fire. In II Kings 2 we read the story of how Elisha then went forth and smote the waters of the river Jordan with that mantle. The mantle of the master signifies his momentum. It represents his attainment, or realization of God. At a certain point the master, or teacher, passes this on to the disciple. He withdraws and the disciple then holds the key position of teacher to those who are coming after. In this manner, the traditions of the Buddha and the Christ have been handed down to us through the ages. What I'd like to talk about in terms of discipleship are the many paths that are open to us as we pursue the way back Home. And what are these paths? In order to accelerate the consciousness of God within us and to magnetize the flame of the ascension, each of us as a disciple must attain to a certain mastery on each of the seven rays. The seven rays come out of the white light of the Holy Spirit. You might say that the Holy Spirit is the full complement of all of the rays of the Christ consciousness. As we walk toward the fullness of the expression of the Holy Spirit, we are required to discipline ourselves on one of these seven rays. These rays are noted by the spectrum of color that we see in the rainbow. What do the seven rays have to do with this concept of discipleship that you mention? In this age of gurus and masters and teachers, it is important to realize that there are truly those who have followed the disciplines of the path of the Christ and the Buddha, mastered time and space and become one with the eternal light. These masters are called the ascended masters because they have reunited with God in the ritual of the ascension. The ascension is merely the acceleration of the vibratory rate of the electrons and the very nuclei of the atoms of being until the vibration is so intensified that the individual actually disappears from the sight or visible spectrum of the disciples. We are evolving on a very fine line of a spectrum. We know that there are sounds we cannot hear because they are beyond our spectrum. We know that there are manifestations we cannot see that are photographed in Kirlian photography. We sense the presence of an aura but we cannot see the aura. Jesus was not the only son of God who ascended into the white-fire core, the central sun of being. There have been many sons and daughters of God both before and after his birth who have attained to this oneness. These sons and daughters of God are our brothers and sisters on the Path. They are not exceptions to the rule but they are the personification of the rule, or the Logos, the Word of God itself. They have had the same resources that we have—a threefold flame of the Trinity within the heart; a Real Self, who is the anointed one, the Christ, the Buddha; and an I AM Presence, whom Moses saw in the bush that burned but was not consumed. These masters have become authorities through their own disciplines. And some, through following one of the rays of God, have become the chohan, or LORD, of that ray. They stand as the wayshowers who show their disciples the path back to the center of their own being through that ray. 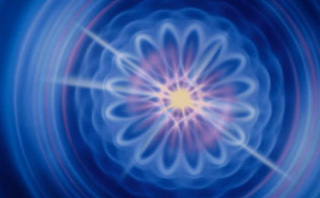 Each of the seven rays that is the fulfillment of an aspect of the Christ consciousness is ensouled by an ascended master who has graduated from the schoolrooms of earth, ascended into the Presence of the AM THAT I AM and stands as the teacher of the way of self-mastery on a particular ray, or radiance, of the Christ mind. The first ray is the ray of God's will, which has a frequency in the spectrum of blue. Those who serve on this ray are those who are inclined to lead, to govern, to administer, to organize and to execute. They are great devotees of the will of God, even if they may not call it the will of God. They insist upon order and system in their lives and they are very devoted to this order. The chohan of the first ray is the one who is the teacher of disciples who serve on that ray. 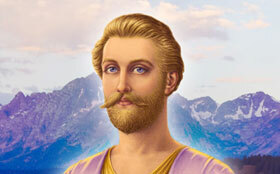 He is the Ascended Master El Morya. He teaches the law of the will of God through the throat chakra in the Science of the Spoken Word. His retreat is in Darjeeling, India, and there he receives chelas of the will of God. Their souls journey to this retreat while their bodies sleep at night. The soul takes leave of the body in the etheric envelope and takes part in the cosmic schoolroom. The second ray, the ray of wisdom, vibrates in the color spectrum of yellow. It is the focus of illumination, the illumined action of God. Its chohan, or lord, is Lanto. Many servants of the wisdom of God have been the teachers of mankind through the ages. Lord Lanto serves from the Royal Teton Retreat near Jackson Hole, Wyoming, which is congruent with the Grand Teton. The second ray is the ray of those who teach, who understand and who know God through the illumined action of his wisdom and the wisdom of his law. These are the quiet souls like Saint Francis of Assisi, who is now the Ascended Master Kuthumi. Beloved Kuthumi occupied the position of chohan of this ray until January 1, 1956, when he became a World Teacher. Lord Lanto's evolution was in ancient China, where through the wisdom schools he drew forth the light of the heart. Those who are seeking to know God by the mind of Christ and the mind of Buddha are disciples on this ray. He teaches the path of attainment through enlightenment, definition and dominion in the crown chakra. You see, the crown chakra is the center for the mind of God even as the throat chakra is the center for the will of God. These chohans guide us in the mastery of each of the seven rays through each of the seven chakras. The third ray is the ray of the love of God, the consummation of oneness in the Holy Spirit. Through this ray, whose spectrum is pink, come the artists, those who are the creative, sensitive and intuitive souls. These are the ones who serve mankind through love, through charity and compassion. They find their oneness with the greater Self in many creative avenues. The LORD of this ray is Paul the Venetian, who was embodied as Paolo Veronese, the great Italian artist. Art, sculpture and all forms of self-expression are taught by Paul as he receives disciples in his etheric retreat, the Château de Liberté, in southern France. The fourth ray extols the purity of God and his discipline. It is the white ray. Disciples of this ray come under the disciplines of the chohan Serapis Bey, whose retreat is the Ascension Temple at Luxor, Egypt. 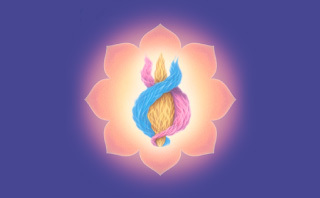 The masters of India teach that the base chakra is the focal point for the Goddess Kundalini and the raising of the energies through the other chakras. It is Serapis Bey who teaches us this discipline. The white flame is the way of those who would contact the blueprint, the inner design, of their handiwork. In the honor and the integrity of the soul's oneness with the law of perfection, they pursue the discipline of the mastery of their sacred labor, the work of their hands, which is the work of the Father-Mother God through them. These are the disciplined ones who are seeking ultimate reunion with God through the greatest sacrifice of the self. This is the way of those who commune in the wholeness of the consciousness of the Divine Mother through purity of body, mind and soul. The color white, of course, embodies all of the rays; and therefore, ultimately, the disciplines of each of the seven rays bring one to this doorway and to the ascension, the soul's eternal liberation. The fifth ray is the ray of truth and the science of God. It is the ray of healing and abundance, which vibrates in the color spectrum of green. Its chohan is Hilarion, who was embodied as the apostle Paul. 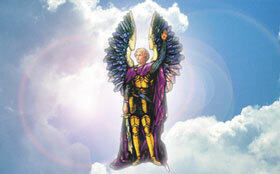 His retreat is the Temple of Truth on the etheric plane over the island of Crete. On this ray, scientists, doctors, healers, mathematicians, musicians pursue a scientific mastery of the self and of the planes of Spirit and Matter. This they do through the quest for truth in every discipline, including the healing arts. And so the fifth ray becomes the means whereby those who require the logic of the Logos can find their way back to the Christ consciousness, back to the God-design. Hilarion is very much involved in working with atheists and agnostics. He comes to show us that true religion is the highest science and that all religion can be proven if we will accept the proof of that which manifests within as well as that which manifests without. And there is just as much empirical proof of the God within as there is empirical proof of the God without. I think sometimes people think that the path of religion cannot be combined with the path of science, but Hilarion, the apostle Paul, shows us that, in truth, true religion and true science are one and the same vibration. The sixth ray is the ray of the master Jesus, of peace and the ministration of God. It is the way of the selfless servant. Jesus served for two thousand years as the lord of this ray. Now as this two-thousand-year cycle is turning, Jesus serves as World Teacher and beloved Nada has become the lord of the sixth ray. She serves in the temple of Jesus, which is the Temple of the Resurrection in the etheric plane over the Holy Land. The sixth ray has a frequency in the spectrum of purple and gold—the purple and gold as the twin flames of Christhood on this ray. Those who serve on the sixth ray with Jesus and Nada have a very devotional nature. Their chakra is the solar plexus, which is tied to the water element, the water body, and therefore their feeling for God is intense. But unfortunately that feeling is often translated into a fanaticism that does not admit to the expansive and progressive revelations of Jesus in this age. Nada's chelas pave the way for the golden age of Aquarius under Saint Germain. The lord of the seventh ray, who is the Master of Alchemy, teaches not only the uses of the energies of freedom and the spirit of liberty but also the way of the alchemical ritual as a necessary component of soul liberation. His ritual is alive with meaning. In his retreat in Transylvania he unveils the symbology of the ritual of the atom and the formulae of the cycles for the release of God's energy in manifestation in man. Saint Germain's retreat in North America is the Cave of Symbols at Table Mountain, Wyoming. The seventh ray, which has a frequency in the spectrum of violet, is the ray of freedom and the forgiveness of God through the alchemy of the Holy Spirit. It is the way of the priests of the Order of Melchizedek. It is also the way of those who are one with the Great Dramatist, God himself, who has conceived of the world as a stage upon which we all play our roles. Saint Germain is the scientist who sponsors invention, innovation, great genius and the mastery of the Matter plane through technology. But he also teaches the law of selflessness and nonattachment so that science does not become a dead materialism but a materialization of the God flame whereby we realize in Matter the fullness of the living God. The alchemy of the seventh ray is of the Aquarian age. It is truly the way of soul freedom. Saint Germain gives us the way of self-transformation through intense invocation of the sacred fires of the Holy Spirit, that violet-flame action that is the dissolving of sin, or the records of past karma.